Overweight and obese children are at risk for getting even more adult illnesses, researchers warn. The Centers for Disease Control and Prevention estimates that 17 percent of children and teens ages 2-19 are obese in the United States. 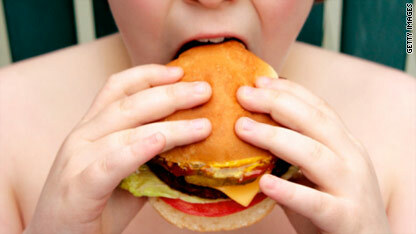 Previous studies have linked childhood obesity to high blood pressure and diabetes. Now a new study says overweight and obese kids face another illness usually seen in adults: Gastro-esophageal reflux disease or GERD. "Being overweight or obese as a child is associated with some very serious medical conditions," says study author Amy Porter. "These adult problems are now being mirrored in the child population." Researchers analyzed data from 690,000 children enrolled in the Kaiser Permanente health plan in Southern California. They found moderately obese children and teens were 30 percent more likely to have GERD. Extremely obese kids and teens were 40 percent more likely to have GERD than those at a normal weight. GERD is a common illness that affects up to 15 percent of people. It causes inflammation in the esophagus, acid indigestion, or heartburn and can cause a person to be very uncomfortable and disrupt daily life. The link between obesity and GERD has been known for adults, but doctors didn't know whether children were suffering from this too. "The problem with that is that the longer people have reflux the more risk they have of developing esphogeaal cancer and that particular cancer is one that is on the rise," said the Kaiser permanente pediatrician. Parents need to think about the medical importance of these study results, Porter says. “If you start having reflux at 6, then at 26, you've had it for 20 years. That's a lot of strain on your esophagus." She says she sees a lot of reflux in babies who are chubby and ones that are skinny; that's normal, but "as kids get older you see reflux coming back ...especially in the heavy kids....pretty much 6 and up is where we were seeing this upswing." So what should you do if your child is overweight? Here are a few tips. Set a family goal to get healthy, by having everyone invested. Parents can model the behavior they would like to see in their children. Encourage the family to gather for meals with no television. Eat more fruit and veggies and drink less soda. Add physical activity into daily life and encourage less television, video games, and computer time. The CDC suggests parents check their children's weight using this calculator. Moms and dads are also encouraged to talk to their pediatrician about any health concerns. The study is published online in the International Journal of Pediatric Obesity. « Previous entryWhat is being done to alleviate stress in the Gulf? If you virtually eliminate sugar and greatly reduce carbohydrates from your children's diets they will most likely no longer have acid reflux – regardless of whether or not they lose weight (although most likely they will also lose weight). They will also NEVER get diabetes, so long as they stick with that way of eating. I am so sick of everyone trying to convince us that being overweight causes these "diseases". It's the inability of your body to process sugar that causes it – thus, if you eliminate sugar in your body, voila, no more "disease". The FDA needs to be split up in order to stop the corruption – the D (drug) should not be able to control our guidelines on the F (food). Drug companies have NO desire for there to be less disease and illness in people without the need for medication. "If you virtually eliminate sugar and greatly reduce carbohydrates from your children's diets they will most likely no longer have acid reflux – regardless of whether or not they lose weight (although most likely they will also lose weight)." Adding the caveat at the end kind of invalidates your opinion. "They will also NEVER get diabetes, so long as they stick with that way of eating." "I am so sick of everyone trying to convince us that being overweight causes these "diseases"." Well...it does. What do you want to hear? "It's the inability of your body to process sugar that causes it"
Complete bull. Refined sugars are actually MUCH easier for the body to process. This leads to spikes in blood sugar and the insulin resistance that develops over time.
" – thus, if you eliminate sugar in your body, voila, no more "disease"." Diets that focus on eliminating a certain macronutrient are short-sighted. Please get your information from a reputable, peer-reviewed source instead of the first few Google hits. Actually, most studies are finding that dietary changes "cure" acid reflux are anecdotal or that these changes are simply the placebo effect. The same studies are also finding that the only lifestyle changes that affected acid reflux are WEIGHT LOSS and changes in sleeping positions. Can cutting back on carbs and sugar help you lose weight? Sure! But the correlation between acid reflux and obesity is BMI, not specific macronutrients. I personally know plenty of people that have gone on low-carb diets (and are still overweight) without the expectation that it would cure their "acid reflux" and yet it cured it. That is NOT a placebo effect – the placebo effect only works if you believe it will cure something. Also, are you really suggesting that only overweight people get acid reflux? Every time I eat too many sugar and/or carbs I get acid reflux and so does my boyfriend. If we don't eat too many carbs we will not get acid reflux – period. Type 1 Diabetes is a different story and is never blamed on being overweight is it? So why even bother bringing it up? Skinny people get diabetes type 2 – it's not just overweight people so your disdainful remark is not factual in the least. Why are diets that eliminate (oh wait, I said "virtually eliminate" not eliminate) short-sighted? Better to take a pill for the rest of your life than just stop eating cookies?? I guess in that sense they are "short-sighted" because you don't have to be a slave to the drug industry for the rest of your shortened life. Please do show me some examples of people that eat virtually no carbs/sugar developing diabetes 2. I would love to see them. Sonia, WTF are you trying to argue about now? Why are you bringing the drug industry into this argument? Nevermind. If half of academia and government health agencies can't convince you that overweight children have a higher occurrence of acid reflux, then I don't believe I can either. Logic doesn't usually fare well against preconceived notions. I never said that overweight children don't have a higher occurrence of acid reflux. What I said was that I was sick of people trying to blame it ON being overweight. AND if you virtually eliminate sugar & greatly reduce carbs they will usually have no more acid reflux – even if they are still overweight/obese. I didn't "bring" the drug industry into the argument – it was in my first post, and you're the one that started the argument. I agree with you whole heartedly....today at lunch I heard two obese women talking about all the meds they were on and all their various diseases. Like yourself, I am a firm believer in taking all available health precautions before getting caught in the cycle of medication. I believe the most important dietary advice is cutting out processed sugar to the greatest extent possible. This concept is not new and it has proven results...not only will it greatly reduce your chances of getting diabetes (common sense....if there is no sugar to process, the body's mechanism for processing sugar cannot be overtaxed), it will also reduce most if not all food allergies, and improve the strength of your immune system. I have seen this proven over and over. So if a person really wants to do something for themselves and not just sit around talking about it, what they need to do is (a) start making water your primary liquid source and drink a lot of it (it's free and refreshing); (b) avoid, to the greatest extent possible, processed foods which contain sugars and other simple carbs (esp. any candy, cookies, white bread, white rice, etc.) and (c) get regular excercise. I guarantee that, unless you have already done too much damage to your system already, these three simple items will make you far healthier than any drug or doctor ever could. I am 41 years old, have never been on medication, have no food allergies, have never been sick (other than the occasional cold) and I have the energy of a 20 year old. I attrribute this to good diet and moderate excercise. I would just ask everybody to do what you can to help yourselves before turning to meds and the medical juggernaut. Obesity causes a lot of diseases, it's been proven with studies after studies on obesity. If you don't want to "hear" them talk about it anymore, that's your problem. But this is one more reason for parents to smarten up and lead their children to a healthier lifestyle. Look up "anectodal" in the context of scientific/medical research. Not necessarily true. But logically speaking, a person WILL feel better once they clean up their diet, for whatever reason. A LOT of that is attributed to psychological well-being, and that "Oh, I feel better" mindset can have that "curative" effect on many pre-existing ailments. Sooner or later, the symptoms will return...if that person hasn't loss significant amounts of bodyfat on such a diet. Where did you get that? Acid reflux is caused by many things, both in and out of our control! ANYONE can get heartburn after a meal consisting of foods they're not used to. If you consistently stay on a low-carb diet, as soon as you overindulge, your stomach acids react accordingly. If you typically eat 5-6 small meals every day (carbs or not), and then eat a huge meal, your stomach acids will react accordingly. Do a little research on the subject...use ACTUAL medical journals. Learn how obesity affects the mechanical function of the lower esophageal sphincter, possibly due to a state of chronic irritation in the bronchial/esophageal pathways. Read the results of studies that show how changes in body mass affect reflux symptoms. And since you're fond of anecdotal evidence rather than scientific/medical studies: I'm a competitive bodybuilder. I can't eat filet mignon on my diet (which contains no carbs), which typically lasts 12-16 weeks. After my last show, I ate a filet & veggies (which I did eat on my diet) and had heartburn for days. Why? Higher fat content than I'm used to eating. Go to a reputable medical research site such as the Mayo Clinic's site and read about diabetes. There are many factors that can lead to the development of the disease. You cannot simply refute scientific/medical research with anecdotal evidence and assumption. Educate yourself. Obesity causes Type 2. Exception: skinny people get it. Genetics causes Type 2. Exception: people without the genetic cause get it. Race causes Type 2. Exception: people of those races don't all get it. Now, what's one factor that is common amongst all people that do get Type 2 Diabetes? Sugar and/or high amounts of carbs. Not everyone that eats lots of sugar and carbs will get diabetes type 2 (because the other factors influence it) but my point is that if you do NOT eat excess carbs and sugar then you will not get type 2. I'm still waiting for someone to point to a study that proves that wrong. Feel free to find a study of obese people on low-carb diets and show me where they still have the diseases that we blame obesity on (diabetes type 2 most particularly). I wanted to add – sure, I offered anecdotal examples. However, there are a lot of studies out there proving that low carb is better for your body when it comes to cholesterol, inflammation and heart disease. There are CERTAINLY plenty of studies showing that it is better at preventing type 2 diabetes as well as better for people that have type 2 diabetes. Being obese is not good for your body (especially on things like your knees and back) and I am not saying that it is. What I am saying is that an obese person can easily be MUCH healthier than a skinny person if the obese person is on a low-carb diet and the skinny person is on a high-carb diet. So is obesity the real cause of the diseases or is it the bad diet? As for your suggestion that it's only when you eat something you're not used to – I disagree. If I don't eat pickles for 3 years and then I eat a whole jar I won't get heartburn. If I eat a tiny bite of cake every day I won't get heartburn – but if I then ate half a piece of cake I WOULD definitely get heartburn. A large percentage of people have a problem digesting and utilizing sugar and carbs properly whether they are obese or not. Incorrect. There are genetic factors involved that can cause it as well, even among those who don't consume excessive amounts of refined sugar or simple carbs. Google "MODY". There are also other medical conditions that cause Type 2 such as Cushing's Syndrome, hormonal imbalance (specifically testosterone and GH) and other thyroid problems, tumors, cancer, pregnancy, chronic pancreatitis and a variety of medications. Diabetes, sure, that can be controlled with making such changes to your diet, but the jury's still out on high-carb v. low carb diets for the general populace in clinical studies. There are studies supporting both sides of the argument. And that also depends on how you define "better for your body". Lots of wiggle room & grey areas with a sweeping statement like that. "Being obese is not good for your body (especially on things like your knees and back) and I am not saying that it is. What I am saying is that an obese person can easily be MUCH healthier than a skinny person if the obese person is on a low-carb diet and the skinny person is on a high-carb diet. So is obesity the real cause of the diseases or is it the bad diet?" Obesity has much farther reaching consequences than a bad back. There are exceptions I'm sure, but the multitude of problems caused by obesity don't simply vanish once one's diet changes. And there are many OTHER factors which contribute to "healthy lifestyle". I can go 12-16 weeks on my diet without sugar or carbs and they don't cause heartburn either once I start eating them again. I'm not saying the same foods provide the same triggers for everyone or even in the same ways. Which I thought I demonstrated with the filet example, but apparently not. Again, I said that there can be contributing factors. But trying to argue that hormone imbalance, cushings etc. have nothing to do with your diet is an interesting line to take... I wouldn't personally go there because from everything I've seen diet has a lot to do with that. Anyways, obviously cancer is a completely separate thing. As for medications that cause it – yet more evidence that the F needs to be seprate from the D in FDA, as I originally pointed out. Let's put aside cancer and meds (though they could probably be included), has there really been any study that proves that people with risk factors can get diabetes type 2 even if they eat virtually no sugar and very few carbs? Plenty of people that HAVE Type 2 are miraculously "cured" when they go on a low carb diet. Studies have shown this happens with people that don't lose weight on the diet. If you do not eat sugar and you severely limit your carbs you will not get Type 2 diabetes. Not if your fat, hispanic, your whole family has type 2, you rarely exercise and have 10 kids. You're digging yourself a deeper and deeper hole. Open a medical journal. Please. Yes, let's just throw out all the examples that contradict your claims (which you have yet to support with any medical evidence, by the way). Second time: cite your source for this claim. You don’t get Diabetes (type 1 ) by eating too much sugar or carbohydrates, it’s an autoimmune response, your white blood cells accidently attacking your Islet cell which produce insulin, killing them off . You get type 2 by having a bmi which your own pancreas can’t keep up with also mixed in with hormones produced by belly fat, I have a child with type 1 diabetes and it infuriates me when people don't differentiate between the two, either educate yourself or specify so the ignorance doesn't continue. Cushings and hormonal imbalances can be caused by cancer/tumors. But when they're NOT the diet can greatly affect these. Think about it – pituitary, adrenal, thyroid can ALL be greatly affected by diet (just think of removing iodine from your diet and what that could do to your thyroid). Anyways, you obviously aren't going to agree with me and I'm not going to agree with you. You can look up the studies proving low-carb improves you're health – obviously you have google. I can look up medical journals and find out what I already know about Cushings and hormonal imbalances. But, then, have any of the people they talk about with Cushings & hormonal imbalance been on a low carb diet for years? Seems unlikely (and I'm saying that because of the fairly small percentage of people that have been on low-carb diets for years). I will say one last thing though – and this is for ALL of the non-believers that read this, not just Leah. Type 2 diabetes, once known as adult-onset or noninsulin-dependent diabetes, is a chronic condition that affects the way your body metabolizes sugar (glucose), your body's main source of fuel. When you have type 2 diabetes, your body is resistant to the effects of insulin — a hormone that regulates the movement of sugar into your cells — or your body doesn't produce enough insulin to maintain a normal glucose level. Untreated, the consequences of type 2 diabetes can be life-threatening. Now, how is it determined that you have Diabetes Type 2? When your fasting blood sugar is too high. When your random-time blood sugar is too high. When your glycated hemoglobin (A1C) test is too high. Now, the last question – barring specific cancers (maybe pancreas or liver) and any wacky pill prescribed to you with really terrible side effects – HOW would your blood sugar get to be too high if you spend your years eating almost no sugar and very few carbs? HOW would your glucose level be too high on a regular basis if you do not feed your body sugar(and too many carbs)? And no, "eating too much protein" will not be an acceptable answer because if you do not eat sugar/carbs but eat a lot of protein it will still not rise to type 2 levels. The only time this could be a problem would be if you already didn't produce enough insulin. Amy & Hmp – If EITHER of you are referring to me try reading my posts. I have said "Type 2" probably 50 times. I am NOT talking about Type 1 and have NEVER suggested that I was. Sonia great job with your points and defending your points. Dr.Food and Leah(TX Animal) it's apparent that you're sponsored by or paid to publish misinformation. Hope both of you can sleep peacefully at night. Then again you may have liabilities that need to be paid for so that's why you HAVE to hold on this misinformation publication position. Look in the mirror once and a while and try to reflect, otherwise one day you may lose your soul. Would you care to provide some support for your position, or is stooping to personal attacks enough for you? Is that what gets YOU to sleep at night? And if refuting a claim that someone who doesn't eat carbs or sugar can NEVER get Type 2 diabetes is "misinformation", I shudder to think what you deem "acceptable". Let's be clear about what causes reflux. It's almost always the result of dysfunction of the lower esophageal sphincter (LES)—the muscle that keeps your stomach and esophagus separate. A normal functioning LES allows food and liquids to pass into the stomach and prevents it from working its way back into the esophagus. When the LES is too weak, diseased, or has too much pressure from the stomach acting on it, it allows stomach contents to pass back into the esophagus. That's a textbook explanation of what reflux usually is. The biggest culprits in this scenario are pressure and substances that weaken the LES. Pressure usually comes from being obese and/or overeating (especially if you overeat frequently). This is why I eat 4-5 small meals a day rather than three American-sized breakfast, lunch, and dinner. Our stomachs just aren't meant to accomodate the gargantuan amounts of food we in developed countries tend to stuff into in them. Just because we have abundance, doesn't mean we should consume it all. Substances that weaken the LES—chocolate, alcohol, foods high in saturated fats, etc.—make the LES unable to do it's job well. These things vary from person to person, but they're especially potent when combined with overeating. I made the mistake of having a large, spicy (something that aggravates my GERD) lunch with a couple of beers the other day and I was suffering the consequences for nearly three days. And this was technically a healthy meal (jerked tofu, veggies, and a side salad). Best things to do for GERD, then, are things to counter and avoid the LES pressure and irritation. Lose weight if you're overweight. Eat smaller meals. Avoid food/drink that upsets your stomach. Exercise (keeps your body working efficiently). Raise the head of your bed (gravity helps keep reflux down at night). I'm unfortunately on GERD medication because even with all the preventative steps I take, I still have moderate symptoms daily. I'm working with my doctor to slowly come off of them, since I don't want to rely on them, but for some people, it's just a fact of life that they need to take them regardless of fitness and lifestyle changes. Uncontrolled GERD can ultimately lead to esophageal cancer, so it's incredibly important to get it under control if you suffer from it daily. NOBODY is arguing with you that Type 2 diabetes can be caused by, or exacerbated by poor diet. NOBODY has said that. It's your original claim that someone who eats a strict low-carb diet and no sugar will NEVER get Type 2 diabetes that's the issue. You've since modified your position to a more general "diet is the issue", and threw out cancer and drugs. You cannot use the words "all", "none" or "never" in a discussion like this and not expect someone to ask for evidence to support your claim, especially on a medically-related topic. And I believe I already addressed this. I PERSONALLY agree that low-carb diets are "healthier", but that is a PERSONAL opinion because it works FOR ME... MEDICAL studies support both sides of the issue. Sonia, you and I ARE on the same page here. We have slightly different viewpoints, but essentially we're on the same track. @Rxdawg: Hmmmm...melodramatic much? It's just my opinion, but it looks like DrFood & Leah were well within their rights to question Sonia's posts. She made some rather dubious claims at the start and didn't provide any support. I agree with Leah, if you're going to make big generalizations in response to an article about a medical study, you should be prepared to defend them. Good on Sonia for stepping up to the plate instead of acting like a kid & calling Leah names, which is exactly what I was expecting as I read through the responses. You'd do well to learn from that, Rxdawg. No, I haven't modified my stance to say diet in general. I believe that if you DO NOT eat sugar and you seriously limit your carbs you will NOT get Diabetes Type 2. I've made exceptions for cancer and medications one because it seems possible that even if you're on a low carb diet that cancer of your liver or pancreas might cause you to be unable to handle any glucose, even at the low to normal levels that you will have on a low carb diet. Has it been proven that you can and would that really be considered Type 2 Diabetes? As for medications well considering all the wacky things that prescribed medication can do to you I wouldn't be surprised if there could be a side effect that makes you grow a second head so I'm happy to make an allowance for that. Victor above said it much better than I have – if there is no sugar to process then your body's mechanism for processing sugar cannot be overtaxed. I have no idea why the ADA has spent so much time and effort denying that their low-fat, high-carb diets are bad for Type 2 Diabetics. What could they possibly have to gain except possibly not having to admit they've been wrong for so long? Sugar is not a macronutrient. Stop taking your children out to McDonalds and cook a healthy home cooked meal. Problem solved. Not only that but studies show that families that eat together at dinner time the children are less likely to get in trouble with the law in the future. But, its irresponsible parents that cave to their chidren's whims for fast food or are to lazy to cook that cause the fat kids in America. Southern States i'm looking at you. I am completely offended by that. I am a southern mom and I rarely eat fast food. It is cheaper to buy groceries and cook. HMMPH. Oh Boy here we go again, Sonia is correct, Skinny people get Type 2, active people get type 2 and so on. What most people don't know is that the last CDC study predicted that the group with the highest rate of death in the US is UNDERWEIGHT PEOPLE. This is because being underweight is a sign of Malnutrition. Organs need fats to protect their inner-lining. Really what need to be focused on is overall health and not BMI numbers. If you can go up a flight of stairs without getting out of breath, or can do certain number of pushups in a minute and have a good HDL, LDL ratio, you should be fine. Nobody's arguing that skinny people can't get Type 2...Sonia stated that all Type 2 patients got the disease because of high carb/processed sugar consumption. That's the issue at hand. I don't think we can argue that overweight people are at higher health risk. Kids or adults should get out f the house a little more .... if was life style change but I did it and in doing so so the my family. I think they forgot to mention that acid reflux can also be a pyschological disorder. I have suffered from heartburn since i was young, i was on prescription zantac by 12. i had a GI done at one point and eventually despite being an overweight child they finally determined it was caused by anxiety and put me on paxil (/sigh). Eventually I began eating better on my own and now I'm 30 and just slightly overweight and guess what, i still have chronic heartburn. The OTC drugs have helped me ignore my heartburn, but I cant believe taking those pills everyday for the last 4-5 years has been good for me either. All said, being an overweight/obese child can have severe psychological effects on children and in my case the teasing and bullying at school cause undue stress for years which in turn can later manifest in real physiological problems. Surprising study as characteristic of adult diseases now begin to present our children and even more surprising is that the survival time decreases the harmful effects of junk food by presenting a delay in mental development, physical deformity and premature death. Over the short time the states will ignore young people who occupy positions of high complexity and intellectual. Kids are not meant to be obese, they need all the exersice thy need to be healthy, parents need to stop feeding them junk food!!!! If you irresponsible parents would get your kids outside everyday and quit feeding them crappy food they wouldn't be fat and you wouldn't have to worry about all this. I had two working parents when I was a kid and none of us were or are fat now and the children of my siblings aren't fat either. Why? Because we didn't sit on our butts all day and eat crappy food! My parents weren't lazy. Neither are we. You're tired of the govt. telling you that your fat? I'm tired of you taxing our health care system. Your fatness makes it more expensive for everyone! People aren't telling you all this because they don't like the way you look. They're telling you because it's expensive and unhealthy. When your ten year old kid is 5'2 and 155+ lbs that's not healthy and it's YOUR fault. This isn't the nicest way for me to say all this but it's time someone says it like this. We're among the fattest in the world. It's NOT healthy and it's costing us money. Wow, Shawn. You're really het up over this, aren't you? I'm overweight and I'm not in the hospitals taxing your precious "health care" system (there's no such thing–that's an invention of the media). I don't even see where it's costing us money–unless you're saying that the overweight individuals don't have health insurance and are failing to pay for whatever treatments they require. That's a bad perspective, since there are skinny folks who are doing the same thing–it's ECONOMICS, dude, not WEIGHT. @ Stu Bradford: Outstanding post! Congrats! For an alternative view of diet treatments for diabetes to the low carb drivel promoted above you might want to consult with some of scientifically proven, peer reviewed studies that have come out from http://www.pcrm.org. By the way, there is no long term study showing low carb is successful in reversing heart disease. There is for whole foods plant based diet. Obese kids have identifiable heart disease in their teens now, so heart disease is a relevant concern for even this age group as the disease will just progress and many of these kids will start having heart attacks in their 30's and early 40's. Very sad. You say that there is no long term study showing low carb is successful in REVERSING heart disease. Is there a long-term study showing low carb CAUSES heart disease? Sonia, if you want people to take you seriously, then don't make such blatantly stupid statements. Wow. So low-carb diets don't cause heart disease so it *must* reverse heard disease?! Holy nutballery Batman...! Daveofmountains you mistook my question entirely. I wasn't suggesting that just because it doesn't cause it means it can reverse it. However, if a low-carb diet doesn't cause heart disease (take a look at some of the studies out there about inflammation, cholesterol etc.) then why dismiss the diet just because it can't cure it? Preventing the disease in the first place seems like a pretty good solution to me. I'm 39 years old and I eat everything in sight. If I'm craving something that's not in sight, I go out and get it. I eat whatever I want, when I want it. I probably eat 4000+ calories per day. Yet I have zero gastro-intestinal problems, zero blood sugar issues, zero health problems of any kind. And at 5'6" 120 pounds, I'm near the bottom of my healthy weight range. Why? I'm a competitive athlete. I train very very hard for 2 to 5 hours every day but sunday. If you work hard, your body will crave whatever it needs to keep up performance. If your kids are fat and having fat-related misery, get them off their flabby behinds. When they exert themselves, their diets will change naturally to accommodate their physical exertion. Then you can say goodbye to acid reflux, blood sugar problems and possibly even asthma. A hard-working kid is a healthy kid. Sweat is good for you. Well the statistics in the article looked fishy to me! Either the journalist made a mess of a real study or the researchers don't know how to view statistics. I suspect both might be true. Epidemiology requires statistically astute people because without any controls or variables to look at, massive data analysis can be used to prove the average person has less than two eyes! (that is a true statement or is it?). I consider this article more junk science! or news media misinformation! Great discussion that is sure to benefit the kids suffering from GERD. I am writing to provide some support for Sonia’s statement that consuming too many carbohydrates may be causing GERD in obese kids. As a GERD sufferer myself, I was surprised to find that my symptoms disappeared when I started a carbohydrate restricted diet. I wondered if carbohydrates somehow caused GERD symptoms and if so, how? My research on the connection between GERD and carbohydrates led to a theory about why carbohydrates may be the ultimate root cause of GERD. If some carbohydrates were not fully digested and absorbed in the small intestine, they would be available as food for intestinal bacteria through a process called fermentation. Could bacteria, malabsorbed carbohydrates and fermentation be causing GERD? The connection between carbohydrate malabsorption and small intestinal bacterial overgrowth or SIBO is well known. When SIBO occurs, normally harmless bacteria become harmful causing inflammation, etc, but many bacteria also produce lots of gas (carbon dioxide, hydrogen and methane) by a process called fermentation. If too much gas is produced but not dissipated efficiently it may create pressure in the small intestine and stomach that actually drives the reflux of stomach contents past the LES into the esophagus. People with weakened or defective LES muscles would be more susceptible to reflux because less gas pressure will be required to force open their LES. 1. Management of dietary carbohydrates improves GERD symptoms and reduces esophageal acid exposure. (1,2,3). I believe reducing carbs is an effective treatment because intestinal bacteria are denied fuel which limits their growth and ability to produce gas. 2. Treatment of GERD patients with the antibiotic erythromycin decreases gastro esophageal reflux and increases apparent LES pressure (4,5). As further proof of this phenomenon, another potent antibiotic called azithromycin reduced gastroesophageal reflux as well as esophageal acid exposure and the concentration of bile acids in fluid removed from the lungs of lung transplant patients (6). Similar to the erythromycin studies cited above, the authors did not consider that the profound effect might be due to the antibiotic treatment inhibiting gut microorganisms. In this case, stomach acid and bile were being refluxed not only into the esophagus, but directly into the lungs. Azithromycin treatment helped prevent reflux into the esophagus and lungs significantly benefiting the patients. 3. Consumption of the carbohydrate fructose oligosaccharide (FOS), which is indigestible by humans, but fermented by gut bacteria produces intestinal gas and increases the number of reflux episodes and symptoms of GERD (7). The authors noted an increase in something called transient lower esophageal sphincter relaxations (TLESRs). In other words, the LES opened more as if it was relaxing. I believe these “Lower esophageal sphincter relaxations” described by the authors actually represent the LES being “forced” open by gas pressure. Consuming FOS ensures 100% malabsorption. The fermentation of FOS by gut microbes makes enough gas to pressurize the small intestine and stomach and force open the LES causing reflux and heartburn in susceptible people. 4. In GERD patients, reflux was associated with an increase in intra-abdominal (gas) pressure and belching (8,9). The increase in intra-abdominal gas pressure and belching is consistent with the idea that gas produced in the small intestine from carbohydrate fermentation can create gas pressure in the stomach and cause belching as the gas escapes into the esophagus. The only difference between belching and acid reflux is that the gas pushes stomach contents into the esophagus in the later case and escapes on its own in the former. 5. Cystic fibrosis (CF) patients have a very high (up to 80%) prevalence for GERD and exhibit well documented carbohydrate malabsorption and bacterial overgrowth associated with pancreatic digestive enzyme deficiency due to blockage of pancreatic ducts with thick mucus (10,11,12). After studying the connection between GERD and CF as well as the details of carbohydrate malabsorption in CF, I am convinced that pancreatic enzyme insufficiency leads to malabsorption, SIBO and the GERD related symptoms so prevalent in cystic patients. 6. The prevalence of GERD in IBS patients (39%) and IBS in GERD patients (49%) is much higher than the prevalence of GERD (19%) or IBS (12%) in the general population indicating a relationship between the two conditions (13). IBS has been clearly linked to small intestinal bacterial overgrowth via hydrogen breath testing and, like GERD, has been treated successfully with carbohydrate restriction as well as antibiotics (14,15,16,17,18). This evidence is consistent with SIBO playing a role in both conditions. 7. Half of GERD patients taking PPI drugs showed evidence of SIBO by glucose breath testing compared to only 25% of IBS patients not taking PPIs. Eighty-seven to ninety percent of SIBO-positive patients (with GERD or IBS) showed improvement after antibiotic treatment (19). 8. GERD is associated with obesity and carbohydrate restriction improved symptoms and reduced esophageal acid exposure in obese patients regardless of weight loss (20,21,22). Obese people consume more food, especially carbohydrates, which I believe can lead to “volume based” malabsorption causing SIBO and reflux. 9. A significant number of GERD patients report new symptoms following fundoplication surgery that include excessive gas (abdominal gas and flatulence), bloating, diarrhea and abdominal pain (23,24,25). The procedure is aimed at preventing reflux, but the side effects are indicative of trapped stomach and intestinal gas as would be expected with malabsorption and SIBO. 1. Yancy WS Jr, Provenzale D, Westman EC. Improvement of gastroesophageal reflux disease after initiation of a low-carbohydrate diet: five brief cased reports. Altern Ther health med. 2001. Nov-Dec; 7(6):120,116-119. 2. Austin GL, Thiny MT, Westman EC, Yancy WS Jr, Shaheen NJ. A very low-carbohydrate diet improves gastroesophageal reflux and its symptoms. Dig Dis Sci. 2006 Aug;51(8):1307-12. 3. Eades M. Protein Power. 1996 Bantam Books. 4. Pennathur A, Tran A, Cioppi M, Fayad J, Sieren GL, Little AG. Erythromycin strengthens the defective lower esophageal sphincter in patients with gastroesophageal reflux disease. Am J Surg. 1994 Jan;167(1):169-173. 5. Pehl C, Pfeiffer A, Wendl B, Stellwag B, Kaess H. Effect of erythromycin on postprandial gastroesophageal reflux in reflux esophagitis. Dis Esophagus. 1997 Jan;10(1):34-37. 6. Mertens V, Blondeau K, Pauwels A, Farre R, Vanaudenaerde B, Vos R, Verleden G, Van Raemdonck DE, Dupont LJ, Sifrim D. Azithromycin reduces gastroesophageal reflux and aspiration in lung transplant recipients. Dig Dis Sci. 2009 May;54(5):972-9. 7. Piche T, des Varannes SB, Sacher-Huvelin S, Holst JJ, Cuber JC, Galmiche JP. Colonic fermentation influences lower esophageal sphincter function in gastroesophageal reflux disease. Gastroenterology. 2003 Apr;124(4):894-902. 8. Dodds WJ, Dent J, Hogan WK, Helm JF, Hauser R, Patel GK, Egide MS, Mechanisms of gastroesophageal reflux in patients with reflux esophagitis. N. Engl J Med. 1982. Dec 16;307(25):1547-52. 9. Lin M, Triadafilopoulos G. Belching: dyspepsia or gastroesophageal reflux disease? Am J Gastroenterol. 2003 Oct;98(10):2139-45. 10. Ledson MJ, Tran J, Walshaw MJ. Prevalence and mechanisms of gastro-oesophageal reflux in adult cystic fibrosis patients. J R Soc Med. 1998 Jan;91(1):7-9. 11. Vic P, Tassin E, Turck D, Gottrand F, Launay V, Farriaux JP. Frequency of gastroesophageal reflux in infants and in young children with cystic fibrosis. Arch Pediatr. 1995 Aug;2(8):742-6. 12. Fridge JL, Conrad C, Gerson L, Castillo RO, Cox K. Risk factors for small bowel bacterial overgrowth in cystic fibrosis. J Pediatr Gastroenterol Nutr. 2007 Feb;44(2):212-8. 13. Nastaskin I, Mehdikhani E, Conklin J, Park S, Pimentel M. Studying the overlap between IBS and GERD: a systematic review of the literature. Dig Dis Sci. 2006. Dec;51(12):2113-20. 14. Pimentel M, Chow EJ, Lin HC. Eradication of small intestinal bacterial overgrowth reduces symptoms of irritable bowel syndrome. Am J Gastroenterol. 2000;95:3503-6. 15. Austin GL, Dalton CB, Hu Y, Morris CB, Hankins J, Weinland SR, Westman EC, Yancy WS Jr, Drossman DA. A very low-carbohydrate diet improves symptoms and quality of life in diarrhea-predominant irritable bowel syndrome. Clin Gastroenterol Hepatol. 2009 Jun;7(6):706-708. 16. Majewski M, Reddymasu SC, Sostarich S, Foran P, McCallum RW. Efficacy of rifaximin, a non absorbed oral antibiotic, in the treatment of small intestinal bacterial overgrowth. Am J Med Sci. 2007 May;333(5):266-70. 17. Pimentel M. Review of rifaximin as treatment for SIBO and IBS. Expert Opin Investig Drugs. 2009 Mar;18(3):349-58. 18. Yang J, Lee HR, Low K, Chatterjee S, Pimentel M. Rifaximin versus other antibiotics in the primary treatment and retreatment of bacterial overgrowth in IBS. Dig Dis Sci. 2008 Jan;53(1):169-74. 19. Lombardo L, Foti M, Ruggia O, Chiecchio A. Increased incidence of small intestinal bacterial overgrowth during proton pump inhibitor therapy. Clin Gastroenterol Hepatol. 2010 Jun;8(6):504-8. 20. Hagen J, Deitel M, Khanna RK, Ilves R. Gastroesophageal reflux in the massively obese. Int. Surg. 1987 Jan-Mar;72(1):1-3. 21. Fisher BL, Pennathur A, Mutnick JL, Little AG. Obesity correlates with gastroesophageal reflux. Dig Dis Sci. 1999 Nov;44(11):2290-4. 22. Austin GL, Thiny MT, Westman EC, Yancy WS Jr, Shaheen NJ. A very low-carbohydrate diet improves gastroesophageal reflux and its symptoms. Dig Dis Sci. 2006 Aug;51(8):1307-12. 23. Vakil N, Shaw M, Kirby R. Clinical effectiveness of laparoscopic fundoplication in a US community. Am J Med. 2003 Jan;114(1):1-5. 24. Klaus A, Hinder RA, DeVault KR, Achem SR. Bowel dysfunction after laparoscopic anti reflux surgery: incidence, severity, and clinical course. Am J Med. 2003 Jan;114(1):6-9. 25. Beldi G, Gláttli A. Long-term gastrointestinal symptoms after laparoscopic nissen fundoplication. Surg Laparosc Endosc Percutan Tech. 2002 Oct;12(5):316-9. Thanks for the detailed post, reasoning, and citations. Logically it makes sense based on MOAs. Very informative! Obviously folks should listen to you rather than my weak arguments but it's nice to know we're on the same page. Rather than listen to me, I would prefer people listen to the science. Unfortunately, dogma is like concrete, difficult to dislodge once set. One of the skinniest kid I know has acid reflex. One of the skinniest kids I know has acid reflex. Poor fat kids. The only thing they got to look forward to is that some day they can have the distinction of being crowned "The Worlds Biggest Loser" or Hot Dog eating champion. Who knows someday they may be the source of all our energy as we use liposuction to remove their fat then have it rendered down to power our automobiles. at the onset of acid reflux take a tablespoon or shot of apple cider vinegar. It will automatically provide remedy and relief. nothing else needs to be done. to keep acid reflux away change your diet. Bread, cranberry juice, pineapple...huge triggers for me. Other people have different triggers. Try a little exercise every once in a while and it will promote other positive lifestyle choices. Message poster "Trip" said it best: "Let's be clear about what causes reflux. It's almost always the result of dysfunction of the lower esophageal sphincter (LES)—the muscle that keeps your stomach and esophagus separate." "Substances that weaken the LES—chocolate, alcohol, foods high in saturated fats, etc.—make the LES unable to do it's job well." I have had GERD for 6 years and will probably need to take it the rest of my life. I eat healthy foods but I tried to go off it twice and the acid in my throat was overwhelming. I am in my 50s, thin, and so is my brother who also has it, so for us, it has nothing to do with being overweight. I believe it is hereditary. Growing up, my father had trouble with acid reflux his entire life, and that was before they called it GERD. Message poster "Trip" said it best: "Let's be clear about what causes reflux. It's almost always the result of dysfunction of the lower esophageal sphincter (LES)—the muscle that keeps your stomach and esophagus separate." "Substances that weaken the LES—chocolate, alcohol, foods high in saturated fats, etc.—make the LES unable to do it's job well." I have had GERD for 6 years, and I take Nexium every day. I will probably need to take it the rest of my life. I eat healthy foods, plus I tried to go off the Nexium twice, but the acid in my throat was overwhelming. I am in my 50s, thin, and so is my brother who also has it, so for us, it has nothing to do with being overweight. I believe it is hereditary. Growing up, my father had trouble with acid reflux his entire life (that was before they called it GERD). More people barking about how it isn't the massive quantities of crap that people consume that makes them fat or ill. No...it must be the universes fault. Don't hand me crap about low carb diets and the like. If you're eating too much crap, then you'll be fat. Case in point...find me a fat etheopian kid. Gastroesophageal reflux diesase Getting Worse? Or Something More going on?My Gerd is constant all day?So a few months ago, I went to the hospital and they told me I had gerd, I also have terrible anxiety and Emetophobia, which is a constant worry for me everyday.. Last July my family got stomach flu and since then vomiting is a constant worrie for me all day everyday.. Since last july i have lost 70lbs due to the fact that since then my gerd has been worse and I barely eat.. I stopped drinking pop and eating sweets, its been about a year. I barely eat.. My worry is, is that lately my gerd symptoms have been worse. I feel the burps trapped in my throat and this ickyness in my throat which constantly is there. I feel weirdness in my stomach, and my stomach is constantly bloated lately?? the bloat wont go away, I also havent had a regular bowl, just the runs.?? One night recently I had this pain in my stomach and also my back starts to hurt and my chest, pains in my chest too.. Im getting worried.. This has become a constant thing everyday.. Also this month my period was irregular it was about 2wks late and it lasted only 2-3 days I bled on and off too.. Im very worried I go to the dr monday to find out the problem, Im just curious if anyone knows what the problem could be, or if anyone has had similar problems and can tell me what this sounds like.. Thanks!! I think fast foods are responsible in creating acid reflux. Kids always love to enjoy junk fast foods. I think by maintaining their food habits we can control their acid reflux. My spouse and I stumbled over here by a different web address and thought I might check things out. I like what I see so now i am following you. Look forward to going over your web page again. ...don't walk...run to get yourselves tested for Vit D levels. If your test is below 50 get your D score up to 65 and get in the sun for 10-20 minutes a day. interesting article, I have been searching for a similar topic for my next blog post. I recently finished writing about silent reflux and heartburn. this post has given me some ideas for my next article. thank you!